Personalized Benjarong Ceramic Pottery From Thailand. Custom Made With Your Own Message. These Gorgeous Thai Bencharong Pieces Are Ideal For Mother's Day, Birthday Gifts, Valentine's Gifts, Wedding Gifts And Any Other Occassion. Customized Benjarong With Your Message Even For Single Piece Orders. Another First From Kaisilver, The World's Largest Provider Of Online High End Custom Made Jewellry. 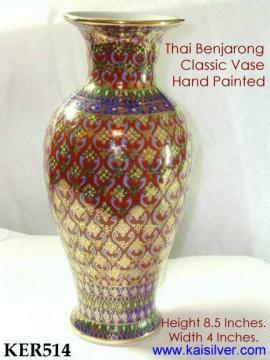 We Now Bring You The Same Level Of Customization In These High End Benjarong Pottery. Bencharong Ceramics Are One Of The Best Form Of Asian Pottery. Select Any Shape Of Benjarong Thai Ceramics From Our Website, Then Select The Design From Any Of The Benjarong Pottery On Our Website. We Now Go A Step Further And Allow You To Personalise Your Bencharong Pottery With A Message Of Your Choice (Optional). 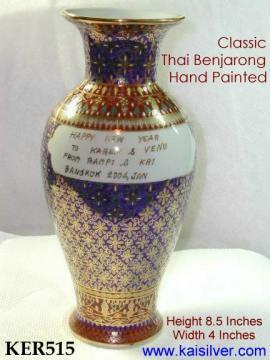 It Is This Complete Customization That Makes Our Bencharong Thai Pottery The Ideal Gift Choice For All Occassions. Each Of These Gorgeous Benjarong Pieces From Thailand Sells For Just 250 U.S$. Add 50 U.S$ In Case You Need Any Customized Message To Be Painted On The Benjarong That You Order. We Bear All Risks Associated With Shipping And Transit. Any Damaged Or Broken Pieces Will Be Replaced At No Additional Charge. Shipping Is 50 U.S$ Per Piece. The Parcels Are Shipped From Thailand And We Will Provide You The Tracking Number When Shipped. Since Every Piece Is Completely Hand Made And Hand Painted Slight Difference In Designs May Occur As It Is Virtually Impossible To Make Exact Replicas. Shipping Will Be Within 3 To 4 Weeks Of Order Confirmation And Receipt Of Payment. You Should Receive Your Merchandise In 4 To 5 Working Days After That. First, Browse All The Gorgeous Benjarong Merchandise On The Website. Next, Jot Down The Shapes That You Prefer, Each Bencharong Item Has An Item Number Printed On The Image Note Down The Item Number. Since These Thai Pottery Benjarong Merchandise Is All Custom Made All Designs And All Shapes Are Available To Choose From. Now Continue Looking At The Stunning Designs Painted On The Ceramic Benjarong Pottery Pieces Shown And Note Down The Item Number Of The Benjarong Painted Design That Interests You. That Is All We Need To Custom Make Your Very Own Benjarong Pottery Piece. Every Piece Is Handled By Some Of The Best Craftsmen And Artists In Thailand. Lastly, Let Us Know If You Need A Custom Message Painted On Your Thai Bencharong Vase Or Bowl. Keep The Message At Around 15 To 20 Words Split Into Two Lines. This Customized Message Will Be Painted On The Benjarong And Will Be A Part Of The Design. Incase You Need To Select A Font For Your Personalized Message See The List Of Fonts Available. Click For Font Options Email Us The Above Details At sales@kaisilver.com We Will Get Back To You Very Soon And Provide All Details For The Benjarong Pottery From Thailand That You Will Be Thrilled With. 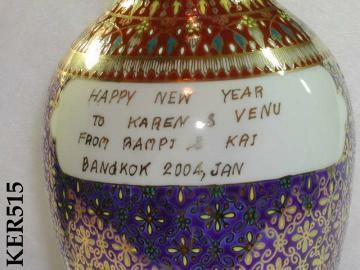 Kaisilver Will Create The Most Spectacular Custom Made Bencharong Pottery For You Along With Your Personalized Message. Complete Customization Is Possible Even For Single Piece Orders. You Really Do Not Need To Place Bulk Orders To Have Your Bencharong Ceramics Customized.